Ash and the team have to get back to business with unlikely allies and forced to take strolls down memory lane, both literally and figuratively, to save the world. THE EVIL DEAD is as cultish a movie as there ever will be. If you hit your teen years at anytime during the 1980's you were swept up in the hype and had to at least give the unlikely trilogy a view. The original Evil Dead was grossly overrated. There was little story and plot to it and seemed more like Sam Raimi was just some film student experimenting on a project. Evil Dead 2 was more like a reboot, a more coherent and polished version of Evil Dead. The development of Ash made it endearing and lovable. Then the studio pulled a fast one and Raimi had to change the name for the third installment, Army of Darkness. Fast forward a couple decades and Bruce Campbell and Sam Raimi got back together to create a series based on that trilogy called -- what else? 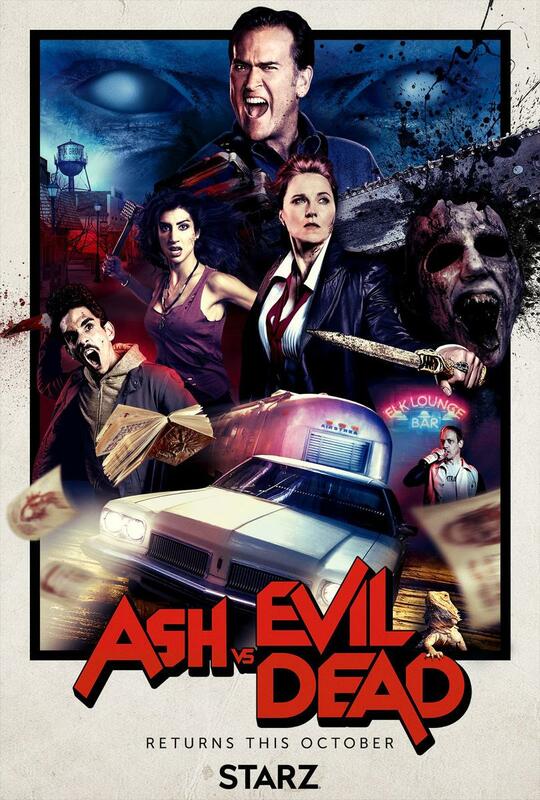 -- ASH vs THE EVIL DEAD. Season two finished up earlier this month and has enough of a following that it appears to be on track for a third season, likely coming out next October. Season one was about Ash being an idiot and getting pulled back into the world of the Necronomicon and demons on Earth. Season one seemed to end with Ash settling on a truce with the main villain, Ruby (played by Lucy Lawless) and decides to retire to Jacksonville, Florida. Of course the world and Ash and his team (Kelly and Pablo played by Dana DeLorenzo and Ray Santiago) can never be safe while demons and deadites walk the Earth. In a moment of perfidy, Ruby's "children", which are vicious demons, turn on her. Ruby has to beg ASh and the team to help her recover the Necronomican. The season ran ten 30-moniute episodes without commercial breaks. Thanks cable! It was like having a little taste of bloody gory horror flick each week without having to commit for the long-haul. Seems appropriate when you have an irresponsible lead-man like Ash. A lot of fun. A bunch of gore. Really nicely executed special effects. This may be a TV series, but Raimi didn't cheap out at all. Again, A LOT OF FUN!